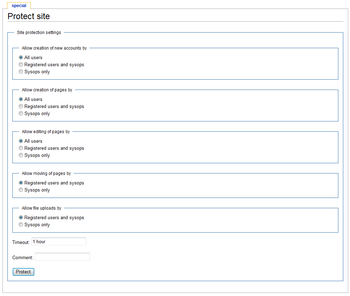 ProtectSite extension allows a site administrator to temporarily block various site modifications. Creation of new accounts, creation of new pages, editing of pages, moving of pages and file uploads can be temporarily blocked through this interface. Because it is meant as a temporary measure to fight vandalism rather than a permanent one, it is not available for school/private wikis where editing is restricted to a smaller group of users than on public wikis. Go to Special:ProtectSite on your wiki. Check the options you want to (i.e. if you want that only administrators could upload files, you'd check "Sysops only" under "Allow file uploads by", supply a timeout in the box (for example, "10 hours" or "1 day") and give a reason for site protection in the "comment" box. After you've done these, press the "Protect" button and the changes will be applied. How do I know if the protection succeeded?